On the dark nights of January 20 and 21, the Division, in an attack designed by the Corps and Army Commanders to gain control of the Liri Valley and outflank Cassino, crossed the swift-flowing Rapido River. The Germans anticipated the assault and they were ready. After a murderous struggle the initial bridgehead, slight holdings a few hundred yards inland on the flat western side, became untenable with supply and follow-up impossible. 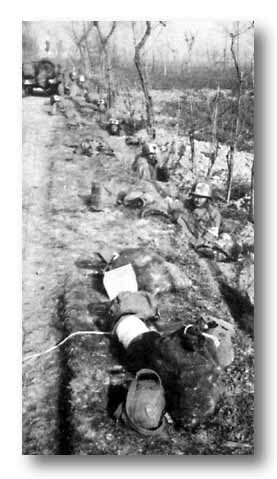 Weary, exhausted, with ammunition gone, men fought bravely until the weight of German counterattacks forced a decision. The Rapido had been a failure. JUST 100 YARDS FROM THE TREACHEROUS RAPIDO, INFANTRYMEN TAKE COVER BEHIND ROCK-CONSTRUCTED STABLE. "When the 36th Division sought valiantly and vainly to establish itself across the icy Rapido River, it suffered losses that look heavy to American military history. It was the boys of the 36th who stumbled through night-screened, minefields, with assault boats on their shoulders and down to the Rapido--suffering immensely en route. It was the boys of the 36th who crawled across a thickly-iced rail-less bridge over a bloody little stream and fell under a bail of gun, mortar and automatic fire in the gallant but vain attempt to establish a bridgehead. "They call the 36th a 'hard luck' division because it has never had an easy assignment. This writer saw one of its battalions when what was left of it clambered back across the Rapido. They were tired but they remained, in essence, fresh-faced boys from Texas. Their eyes mirrored no peace." 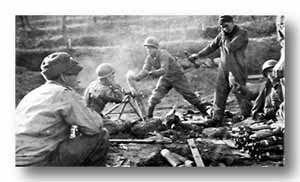 81MM MORTAR CREW IN ACTION DURING THE RAPIDO RIVER STRUGGLE. MEN WEAR POPULAR WINTER COMBAT TROUSERS. PIG STY. 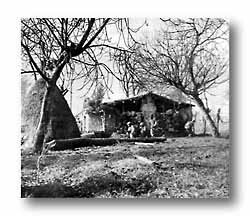 This thick-walled pig sty served as the 143rd's message center while the fight was being carried across the river. Drinking K-ration coffee is Pfc. Ralph G. Simpson, Cincinnati, Ohio, while Pvt. William Munves, Bronx, N.Y., answers the phone. SCORE. 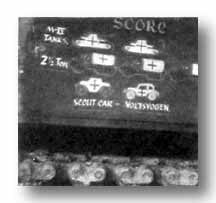 One Cannon Company platoon kept score of the damage it was doing: two Mark IV tanks, three two and one-half ton trucks, one scout car and one volkswagon. Close-up right is painted on the rear of a self-propelled mount. MEDICS. A group of litter bearers take cover from sniper fire 700 yards from the Rapido. With casualty toll exceeding that of all other previous engagements, the medics had their toughest assignment here. S/SGT. THOMAS E. McCALL, infantryman of the 143rd, won the Division's seventh Congressional Medal of Honor for gallantry during the Rapido River crossing. Leading his machine gun section across muddy, exposed terrain and through barbed wire entanglements, Sgt. McCall knocked out two enemy machine gun nests and was captured while assaulting a third.